Mullin's World: The Messiah of the Right, Rush Limbaugh, a bombastic, crude, demagogue, racist who panders to intolerance and the basest instincts of our society. The Messiah of the Right, Rush Limbaugh, a bombastic, crude, demagogue, racist who panders to intolerance and the basest instincts of our society. The Messiah of the Right, Rush Limbaugh, a bombastic, crude, demagogue, racist who panders to intolerance and the basest instincts of our society. One group that is strongly in the Limbauga camp is the evangelical movement. It is composed largely of white midwest and southern American population. They are mostly low income and working class, poorly educated with strong beliefs in the bible and the evangelical message while supporting a Right Wing agenda. They are opposed to gay rights, gay marriage, abortion, civil rights, and inclusion and support the Republican party. They are led by a range of religious leaders from James Dobson to Rick Warren. See chart below which is out dated, a more current report would assume a ten to twenty percent increase. 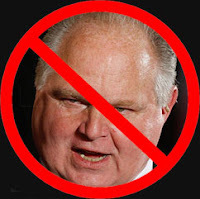 Limbaugh's appeal is his limited message, he keeps it a simplistic, anti-intellectual and his rambling dialogue is full of code hate speech and simple Right Wing phrases. All the time suggesting that anyone who disagrees with this warped point of view is un-American. Hate is a big part of the message. His recent foray into the world of the National Football League ended after the members of the owners association, mostly Republicans, were outspoken in opposition to his involvement. In addition the players from the NFL were un-charististicly opposed to his involvement, citing his racist statements and his attitude to black Americans and Americans of color including his statements against Obama. His audience is large but a minority of Americans. He speaks to a dedicated audience looking to reinforce their prejudices and intolerance while wrapping themselves in the flag, and their perception of an America that doe not exist. Limbaugh is someone that the real Republican mainstream, the middle, need to distance themselves from if it is ever going to again take it's place as the party of A. Lincoln and T. Roosevelt. Fox, white man News finally being seen as it really is. Not a news service but a propaganda arm for the Right Wing Republicans. The phrase "Fair and Balanced" is a necesary lie and is beginning to be seen for what it is. Rahm Emanuel disses Fox, white man, News as not a news service. Republicans need a lot of work.